Land plants can be divided between vascular plants (tracheophytes) and non vascular plants (bryophytes). At least 20,000 species of non vascular plants exist. These plants rank among the oldest types of plants on earth. Bryophytes include mosses, liverworts and hornworts. While sometimes considered primitive or simple, non vascular plants possess many fascinating qualities and serve important roles in their respective ecosystems. Non vascular plants, unlike vascular plants, do not contain conducting tissue such as xylem. Examples of non vascular plants or bryophytes include mosses, liverworts and hornworts. While many species of non vascular plants require moist environments, these organisms reside throughout the world. Non vascular plants play important roles as keystone species and ecosystem indicators. Mosses are non vascular plants that fall under the phylum Bryophyta. Of all the bryophytes, mosses more greatly resemble vascular plants than do liverworts and hornworts. Some mosses even possess stems that conduct water internally, similarly to vascular plants. They do not grow flowers. At least 15,000 species of moss have been discovered; mosses therefore represent the most diverse type of non vascular plants. Mosses possess rhizoids, small root-like parts of their stem, but these do not conduct nutrients in the manner as true roots in vascular plants. Mosses do not absorb nutrients via rhizoids but instead via their small leaves, which branch out from stems. Water from rain moves across the moss and is absorbed by it. Many moss species form mats or cushions, and the cushion size correlates to water and gas exchange depending on surface area. Not all mosses fit the typical image of soft, green mats. Polytrichum juniperinum, for example, boasts red leaves. Gigaspermum repens, on the other hand, grows white leaves. Unlike vascular plants, mosses reproduce via spores that form either in the centers of leaves or on their shoots. Moss spores require water for the transference of male sperm to female eggs. Mosses disperse their spores onto moist substrates over a greater period of time than hornworts. Mosses at Home and at War: Landscapes around the world often host mosses, either planned or incidental. Mosses prefer damp, cool environments. These non vascular plants provide appealing landscape features with their tufts and carpets. Additionally, mosses thrive in areas of compact or poorly drained soil with low fertility. Mosses come in many shapes and colors as well. 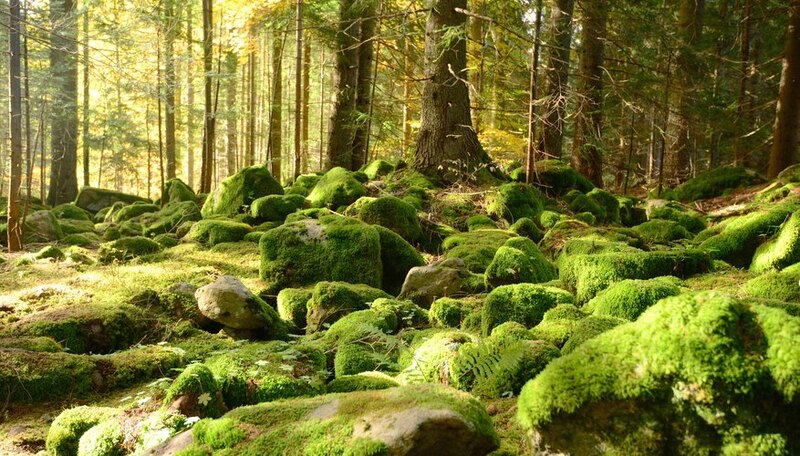 Some examples of mosses used in landscaping include sheet moss (Hypnum), which prefers rocks and logs; rock cap moss (Dicranum), hair cap moss (Polytrichum) and cushion moss (Leucobynum), all of which grow in clumps on soil. Sphagnum moss species represent the largest moss species, boasting an array of colors and thriving in very moist regions such as ponds, streams and marshes. Also called peat moss, sphagnum moss forms bogs in bodies of water, and its high acidity renders areas around it sterile. In fact, during World War I, sphagnum moss became indispensible in dressing wounds. Because of a shortage of cotton for bandages, healers grew desperate for material to pack and help heal the wounds of many thousands of injured soldiers. Because of its ancient medicinal use and its incredibly high absorptive qualities, sphagnum quickly served this crucial role. Its abundance in the moist regions of the battlefields benefited the cause. Citizens at home and abroad aided in collecting sphagnum to ship to the war-torn areas. Two particular species, Sphagnum papillosum and Sphagnum palustre, worked best to stop bleeding. Not only is sphagnum twice as absorbent as cotton, it possesses unique antiseptic characteristics due to the negatively charged ions in its cell walls. This aids in attracting positive potassium, sodium and calcium ions. Therefore the wounds packed with sphagnum benefited from a sterile environment with a low pH that limited bacterial growth. Liverworts are non vascular plants that comprise phylum Marchantiophyta. “Wort” is an English word for “small plant.” Liverworts therefore gained their name from being a small plant that bears some resemblance to a liver, and they were once used as herbal medicine for the liver. Liverworts are not flowering plants. Liverworts exist in two gametophyte forms; they possess leafy shoots on stems (leafy liverworts) or they may have a flat or wrinkled green sheet or thallus (thallose liverworts). The thallus can range from thick, such as in species of Marchantia, to thin. Cells within the thallus possess varying functions. The small leaves of liverworts do not possess ribs. Liverworts possess rhizoids. These generally single-celled rhizoids function as anchors to substrates but do not conduct fluids like true roots. Liverworts disperse their spores from a capsule in a short period of time. Alongside the spores, tiny spiral-shaped elaters aid with spore dispersal. A common landscaping liverwort found in parks and nurseries is the thallose species Lunularia cruciata, which boasts thick and leathery thallus. Most liverwort species, however, are leafy rather than thallose, and closely resemble mosses. Some colorful examples of liverworts include Riccia crystallina, which are white and green, and Riccia cavernosa, with red features. The Cryptothallus liverwort does not contain chlorophyll, but instead possesses a white thallus. The Cryptothallus liverwort also lives in symbiosis with a fungus for its food. Another interesting feature of liverworts is their production of mucilage via slime cells or slime papillae. This mucilage serves to retain water and prevents the plant from becoming dehydrated. Most liverworts also contain oil bodies in their cells that produce terpenoids. Liverworts exist in vastly different ecosystems around the world, growing nearly everywhere from Antarctica to the Amazon, and so provide important habitats for many other organisms. Hornworts belong to phylum Anthocerotophyta of the non vascular plants. Hornworts do not grow flowers, and they gain their name from their spore capsules, the sporophyte part of the plant that resembles a horn growing out of the thallus. In this gametophyte portion of the plant, these lobed, branchlike thalli house guard cells. As in liverworts, these thalli resemble flat, green sheets. Some species’ thalli appear rosette-shaped, while others look more branched. The thalli of most hornwort species tend to be several cells thick, except for those in genus Dendroceros. Hornworts do not possess leaves like mosses and liverworts. Under their thalli, rhizoids grow and serve as substrate anchors rather than true roots. Hornworts disperse their spores over time generally by water. Unlike liverworts, hornworts do not posses slime papillae. Hornworts are, however, capable of producing mucilage from most cells. In turn, mucilage collects in cavities in the thallus. Unique among the bryophytes, these thalli fill with a genus of cyanobacteria called Nostoc. This symbiotic relationship gives hornworts nitrogen, while the cyanobacteria gains carbohydrates. As with liverworts, small elater-like structures aid in spore dispersal. Far fewer hornworts exist compared to mosses and liverworts. Only six genera of hornworts are known at present: Anthoceros, Phaeoceros, Dendroceros, Megaceros, Folioceros and Notothylas, with approximately 150 known species at this time. An example of a hornwort living in a geothermal environment is Phaeoceros carolinianus. At present count, approximately 7,500 species of liverworts and hornworts exist around the world. Both non vascular plants play important roles in the ecosystems of forests, wetlands, mountains and tundra. Increasing awareness of the biodiversity of these interesting plants aids in their conservation. Both liverworts and hornworts serve as climate change indicators due to their role in carbon dioxide exchange. Non vascular and vascular plants are thought to have diverged approximately 450 million years ago. Vascular plants contain water- and nutrient- conducting tissue called xylem. Non vascular plants or bryophytes do not contain xylem tissue, or vascular tissue, to move nutrients. Bryophytes rely upon surface absorption through their leaves. While vascular plants use an internal system for water, non vascular plants use external means. Unlike vascular plants, non vascular plants do not possess actual roots, but rather rhizoids. They use these rhizoids as anchors, and use them with their leaf surfaces to absorb minerals and water. The life cycle phase for each type of plant differs as well. Vascular plants exist in their photosynthetic phase as diploid sporophytes. Non vascular plants, on the other hand, have short-lived sporophytes and so rely upon their haploid gametophyte incarnation for their photosynthetic phase. Most bryophytes do contain chlorophyll. Non vascular plants do not produce flowers, but they do require water for their sexual reproduction. Non vascular plants also can reproduce asexually and sexually. Bryophytes can reproduce asexually via fragmentation. Unlike vascular plants, non vascular plants do not produce seeds. Non vascular plants chiefly display their gametophyte forms. The gametophytes of non vascular plants alternate to sporophytes, which, in turn, produce spores. Their spores travel via wind or water, unlike the pollen of a vascular plant that requires pollinators for fertilization. Non vascular plants come in several size ranges, from the very tiny to long strands over a meter in length. Non vascular plants tend to grow as mats, tufts and cushions on various substrates. These plants grow in many different areas of the world. 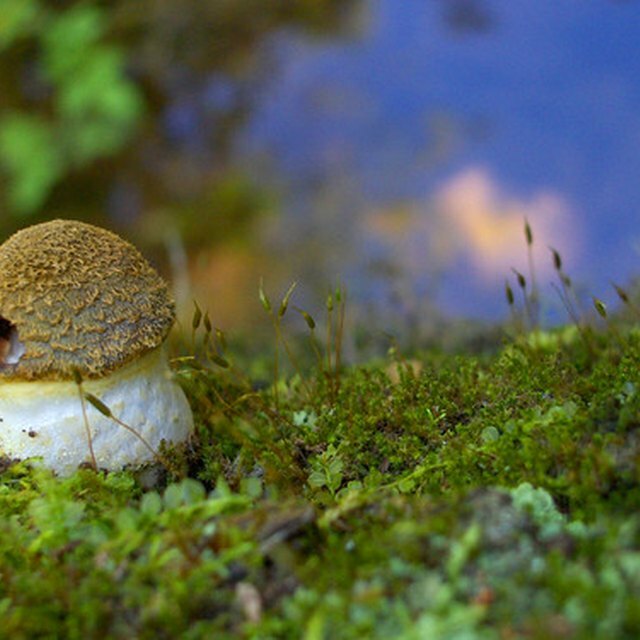 Though they prefer moist environments, they can also be found in harsh climates such as in the Arctic and in deserts. Even a small amount of humidity in the form of dew can give non vascular plants enough water to exit dormant states, due to the surface characteristics of bryophyte canopies, which can change quickly to adjust to water changes. Bryophytes enter dormancy in conditions of drought or cold in order to survive. Non vascular plants can grow on rocks, new volcanic material, trees, soil, garbage and numerous other substrates. The resilience of non vascular plants vs. vascular plants contributes to their long-term survival. Are Lichens Non Vascular Plants? Lichens superficially resemble non vascular plants, such as mosses. Lichens, however, are not non-vascular plants. Lichens represent a symbiotic relationship between fungus and algae. They often occupy similar ecological niches and substrates as non vascular plants. Occasionally dismissed as “lower” or “primitive,” non vascular plants play crucial roles in the environment. They serve as seedbeds for other plants, giving a moist substrate for seeds to germinate. Non vascular plants also absorb nutrients from rain. They prevent soil erosion, due to their highly absorptive qualities. The water absorbed by non vascular plants releases slowly back into the environment. This aids trees in absorbing and retaining water as well. Non vascular plants can even stabilize dunes. Non vascular plants also absorb airborne nutrients. Their dried peat serves a number of uses. Since peat sequesters carbon, protecting swamplands and layers of peat prevents the release of this carbon back into the atmosphere. Because non vascular plants occupy specialized niches in their respective environments, they play the role of keystone species. Non vascular plants require specific abiotic factors including light, water, temperature and chemical composition of their substrates. They also house small invertebrates and eukaryotes, fulfilling a role in food webs. The size and easy reproducibility of non vascular plants lends them to great accessibility for plant biologists to study. The complex interaction between non vascular plants, vascular plants, animals and the environment proves their ecological importance. Likely many more non vascular plants await discovery and identification. Australian National Botanic Gardens: What Is a Bryophyte? University of Maryland Extension: Moss in Your Landscape: Friend or Foe? Australian National Botanic Gardens: What Is a Liverwort? Australian National Botanic Gardens: What Is a Hornwort? Dianne, J.. "A List of Non Vascular Plants." Sciencing, https://sciencing.com/list-non-vascular-plants-6193016.html. 14 August 2018.